:William, the capable former cellarer (administrator), has returned to St Alcuins at Abbot John's request to help his replacement learn the ropes. But William's return coincides with a bishop's visitation, a regular event. The bishop, a zealous churchman with a large entourage, has heard rumours of St Alcuins having had in their community one William de Bulmer, who is said to have attempted suicide and left the order ? attempted suicide is a felony, and breaking monastic vows is a grave sin. (For those unfamiliar with the series, the bishop is entirely correct). The bishop wants to know where this man is so he can be arraigned before an ecclesiastical court, and wishes to discover what happened and what part Abbot John played in those events. His suspicions are well founded. As the story unfolds, the beautiful thread of the Gospel weaves quietly through the contrasting colours of human frailty, religious zeal and social pretension. 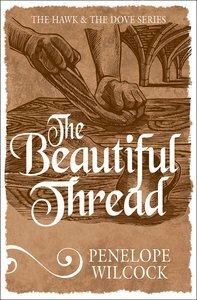 About "Beautiful Thread (#08 in The Hawk And The Dove Series)"